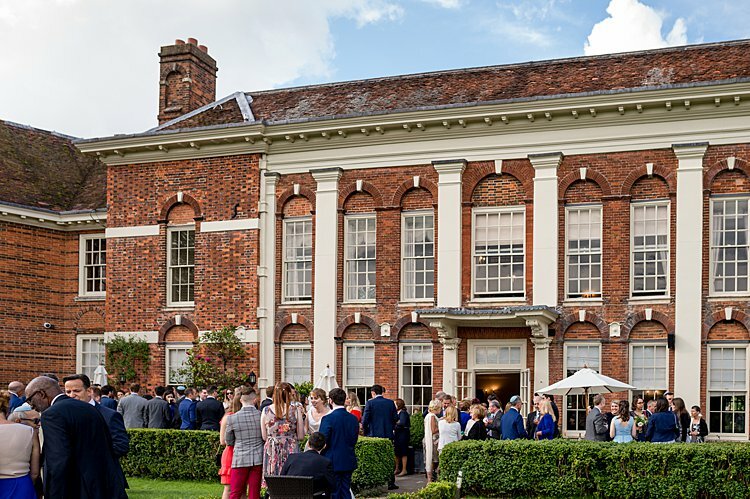 We got married at Parklands Quendon Hall. 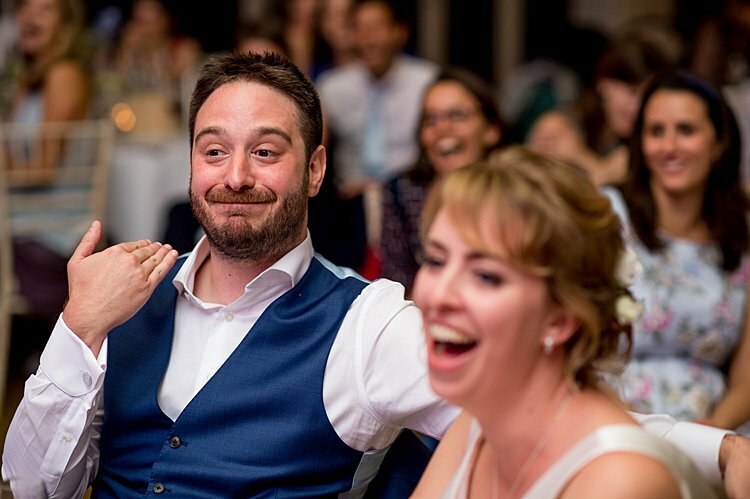 We agreed almost as soon as we got engaged on what kind of venue we wanted – it was one of the few things Ian had a strong opinion about! 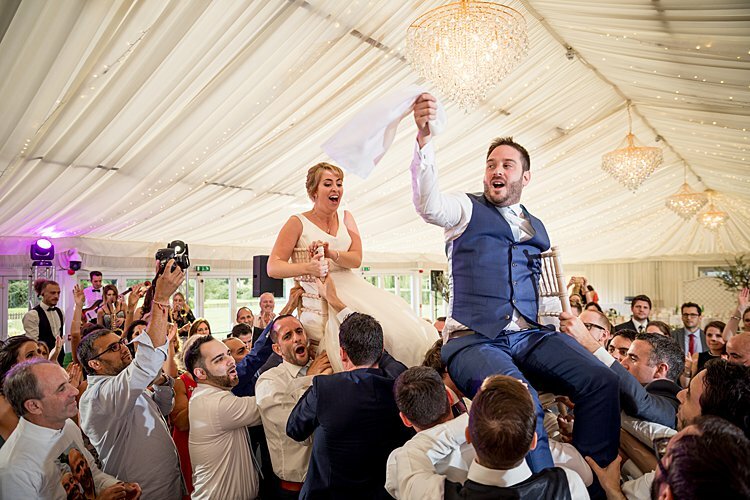 We didn’t want a traditional London hotel wedding. 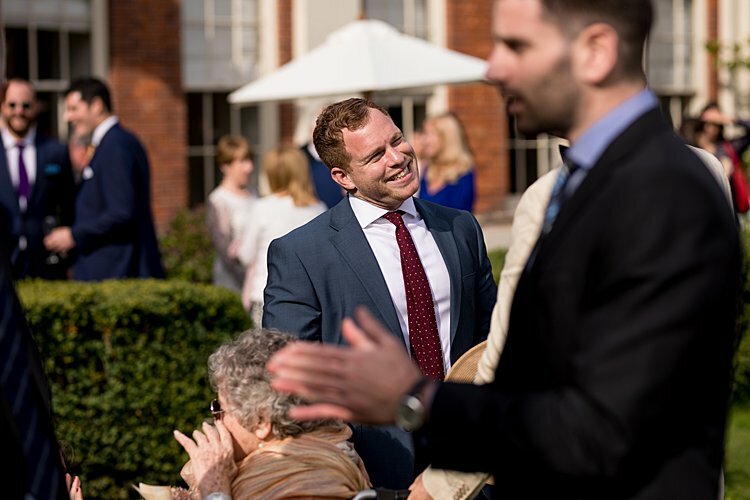 We wanted somewhere in the countryside with beautiful grounds so we could be outside if the weather was nice, and space for our families to stay with us and make a weekend of it. But also somewhere near enough to London (where most of our friends and family live) that people didn’t have to make an overnight trip if they didn’t want to. 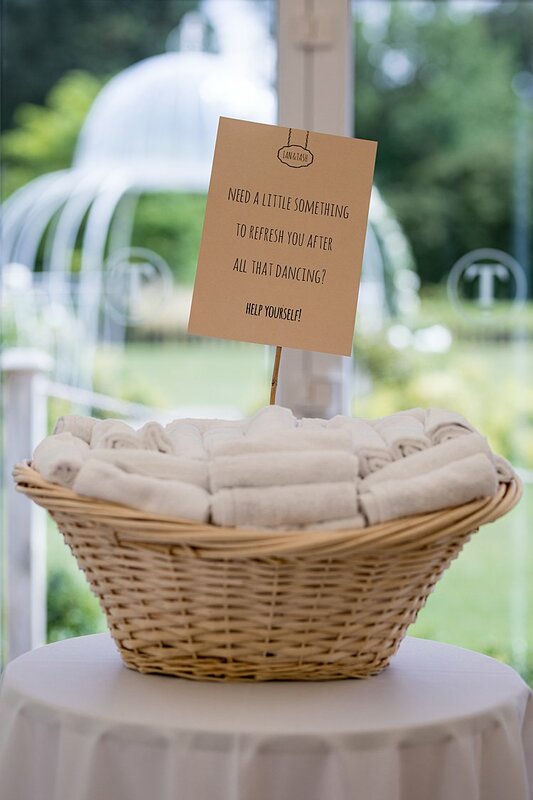 This was easy in theory but proved quite hard to find in practice – particularly as we were looking for somewhere to accommodate our 230 guests! But as soon as we walked in to Parklands we knew it was the right place. 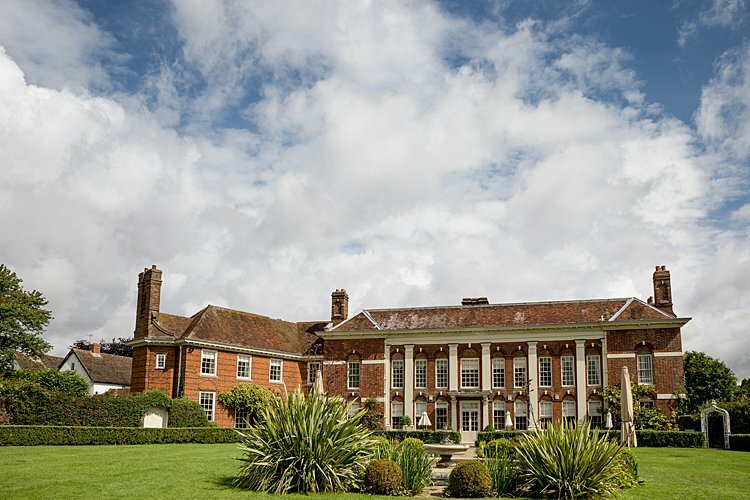 It’s an absolutely beautiful country house with gorgeous gardens, set in its own deer park (! 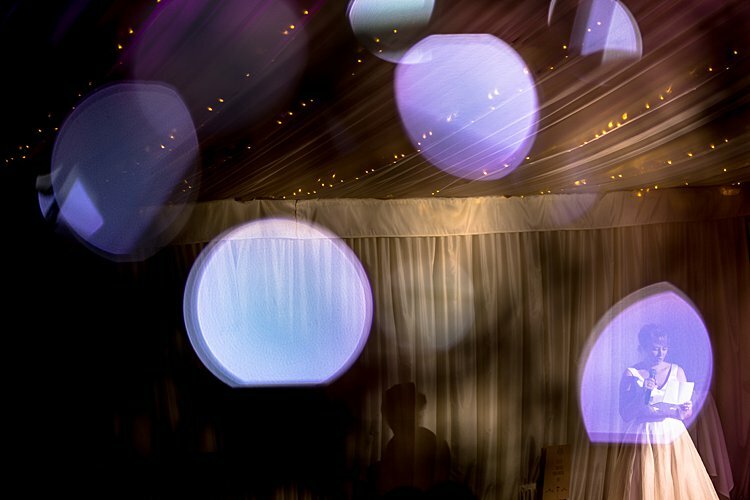 ), with a stunning permanent marquee that could fit everyone comfortably. 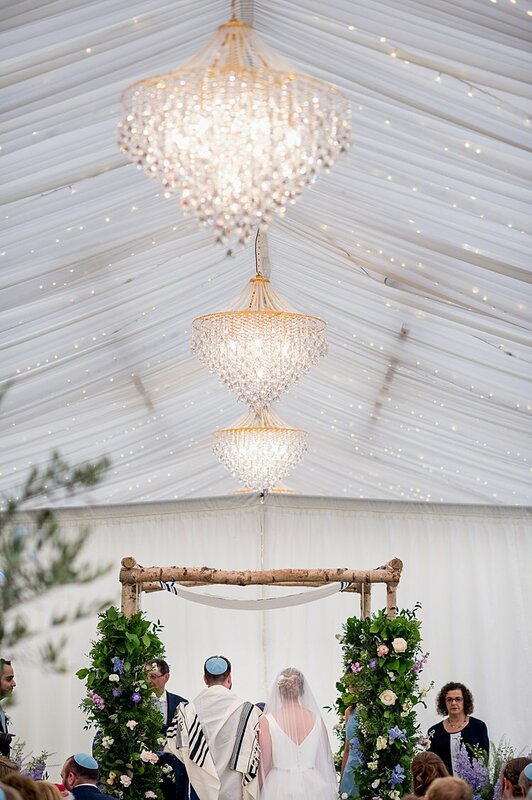 We were planning to have our ceremony in the garden, but in the end the weather on the day wasn’t playing ball so we switched it to the marquee. And we still got to have the reception outside so everyone could enjoy the beautiful grounds. The house was exclusively ours for the day, which was really important to me. And it has loads of accomodation so both our enormous families and our wedding party could stay over – plus an amazing honeymoon cottage where we spent our wedding night. But it’s also only an hour from London. 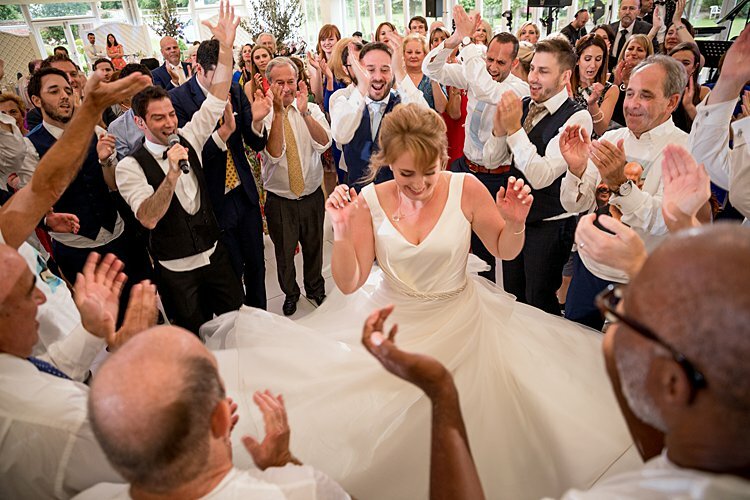 All the staff there were wonderful and bent over backwards to make our day perfect for us – nothing was too much trouble. And my dad came with us on a visit just before he died, which made it even more special as I have such a great memory of him sitting in the garden looking over the fountain at the deer and being so happy. I knew I wanted a relaxed, shabby chic style. But beyond that I didn’t have a theme or particular idea of how I wanted the day to look. 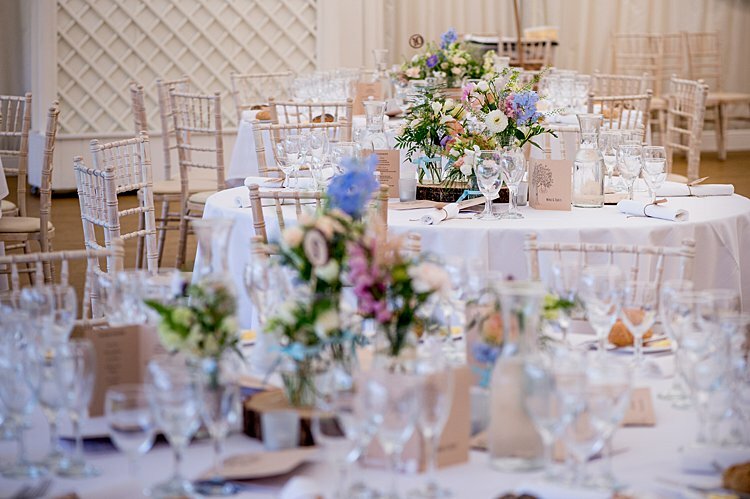 I got inspiration from wedding blogs (particularly Smashing The Glass, obviously) and a LOT of Pinterest-ing, which was massively helpful in showing my suppliers the kind of thing I was going for. Plus I did quite a bit of stealing ideas and actual decorations from friends’ weddings – I used the gorgeous bunting that my bridesmaid Steph’s mother-in-law had made for her wedding, and the table center log slices that my bridesmaid Gabi’s parents-in-law had chopped from a tree in their garden for her wedding. 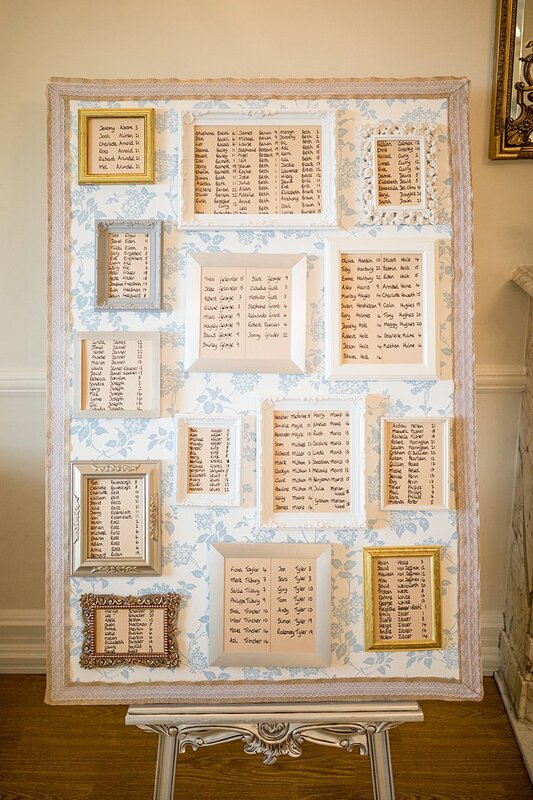 I would 100% recommend this if you love things at weddings you go to, people really like to be asked and are usually happy to get more than one use out of the things they’ve bought/made! We didn’t use a professional wedding planner. My mum and I did most of the planning, with lots of help particularly from Ian’s parents as well as other friends and family. And Parklands provided an on-the-day organizer who made sure everything went smoothly. It meant that we could relax and enjoy the day rather than stressing about where everyone was supposed to be and if we were running on time. In terms of decoration, Parklands is already so gorgeous that it didn’t need much. 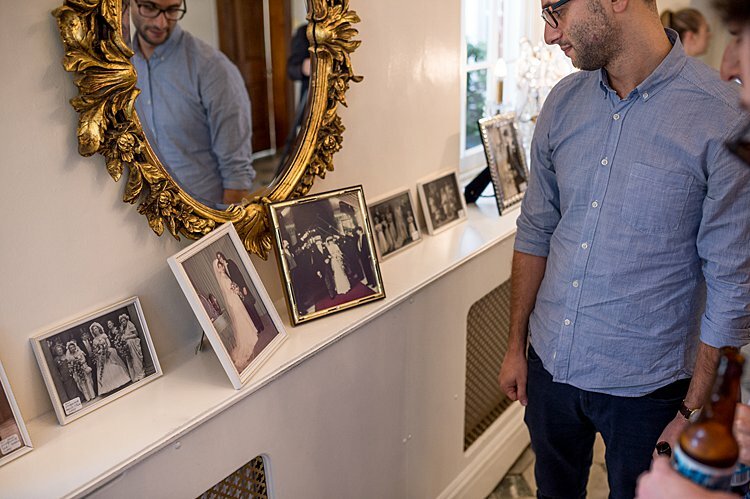 And we also had family wedding photos going back 4 generations, which we displayed in the entrance hall as guests came in, which made it really feel like ours. I was very lucky that a friend of my mum’s is an illustrator and agreed to help create our wedding stationery. 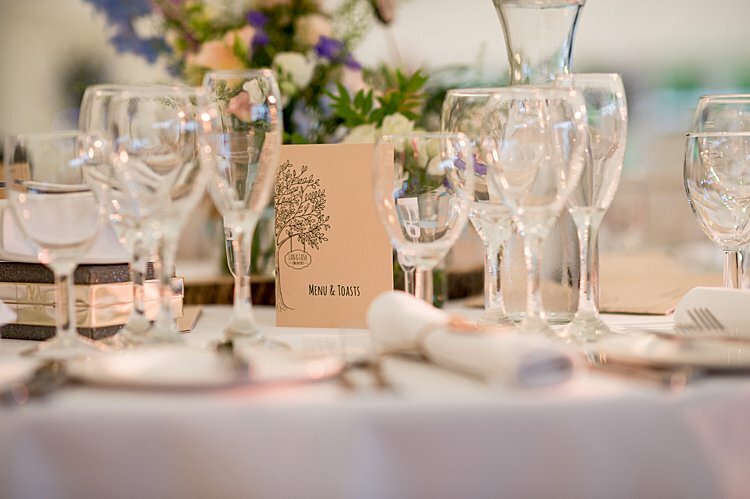 Emily Dawe did a gorgeous pen drawing of our venue, which we used on the invites, and then, inspired by the setting, drew a beautiful tree that became the centerpiece of all our stationery. I was recommended The Print Team in Golders Green, and I worked with Charlie there to design all the stationery, choose fonts and paper, etc. We ended up going with a relaxed style and brown paper/card, which tied in with the overall look. I had quite a clear ideas about what style of dress I wanted. I knew it would have a full skirt, and I knew I didn’t want strapless. I was looking for something flattering that was also easy to wear, as I wanted to be able to breath, move, eat, and dance my feet off – all the essential stuff! I had a full day of dress shopping with my mum and bridesmaids. I loved trying on all the amazing dresses, but it was really exhausting, which I hadn’t expected, and although it was great fun I’m glad I found “the one” that day and didn’t have to shop anymore. ‘The one’ was ‘Charlotte’ by Stephanie Allin. 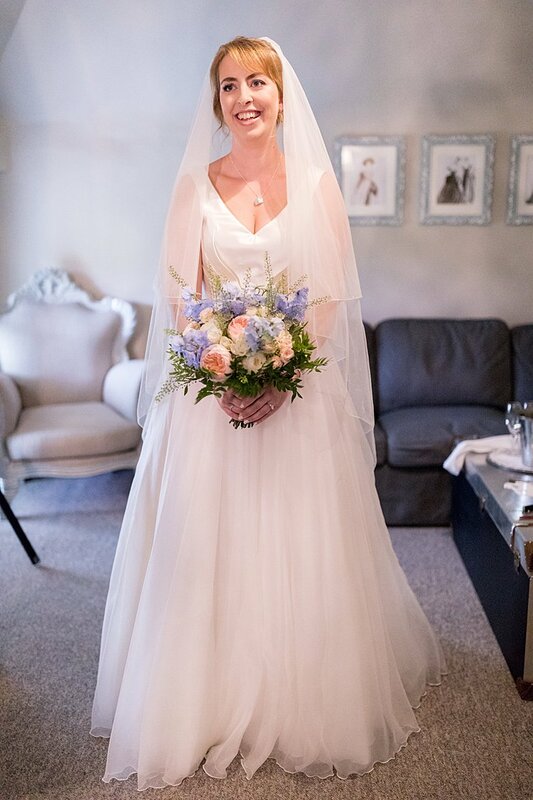 I saw it on Stephanie’s website before I’d even booked an appointment and thought it was a contender, but as soon as I tried it on I knew it was my dress. It was the only one that made my mum cry! I teamed it with a gorgeous belt, also from Stephanie Allin. 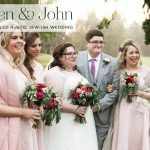 I absolutely loved everything about it – from the experience of buying it (I went to Stephanie’s London boutique and was so lucky that I got to meet her in person for one of my fittings) to wearing it on the day. 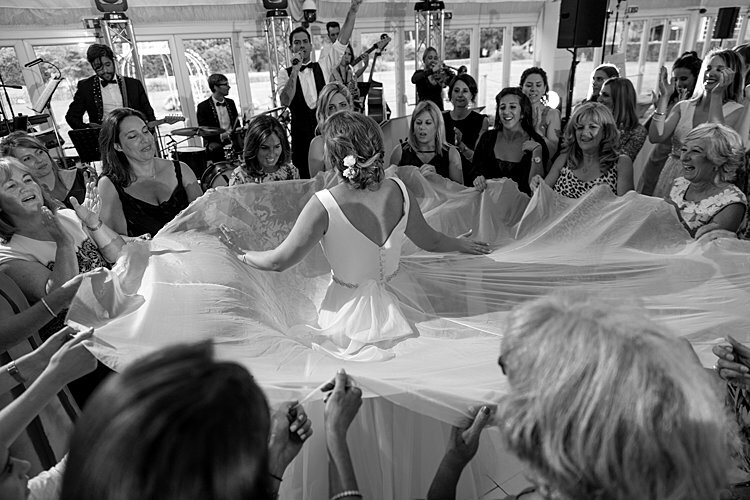 It was the most fun dress I’ve ever worn – it had the best twirling skirt ever! I couldn’t stop spinning around in it. I kept my jewelry very simple, as I thought the dress didn’t need much embellishment. I wore some diamond earrings that my sister lent me, and a bracelet my dad gave me, which I wear every day. The day before the wedding my sister gave me a beautiful necklace with my new initials and a locket with a picture of my dad, which I also wore. Both the bracelet and the locket were really important in having dad close to me on the day. I had a few flowers in my hair, but apart from that I kept it simple. My veil was my something borrowed; it was my cousin Dani’s (who was also my bridesmaid) and was cathedral length with tiny crystals all over it so it sparkelled a bit in the light. It was gorgeous and also acted as my train for the ceremony. And I wore a blue garter which has been in my family for years – it was my grandma’s, and my mum and my aunty both wore it on their wedding days. 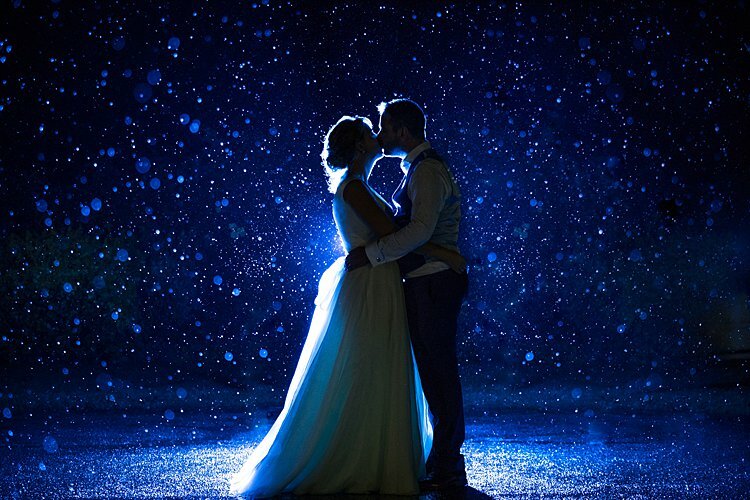 So it was my something old and blue. But I have to admit I took it off after the ceremony as it wasn’t the most comfortable! My shoes were Rainbow Club from John Lewis. I went for their Harlow Mary Janes. I didn’t want my shoes to be too fussy as I knew no one would really see them under the dress. My main thing was being able to walk in them, as I’m absolutely rubbish in skyscraper heals! 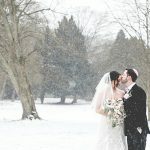 There was never any question that I would have Laura from Laura Anne Makeup for my wedding. She’s the most fabulously talented hair and makeup artist, as well as a lovely friend. I wanted to look like the best version of myself, rather than overdone. I never normally wear much/any makeup, so I wanted to look quite natural. My hair is very fine and thin, so I wore it up so it would look thicker and stay that way for as long as possible. 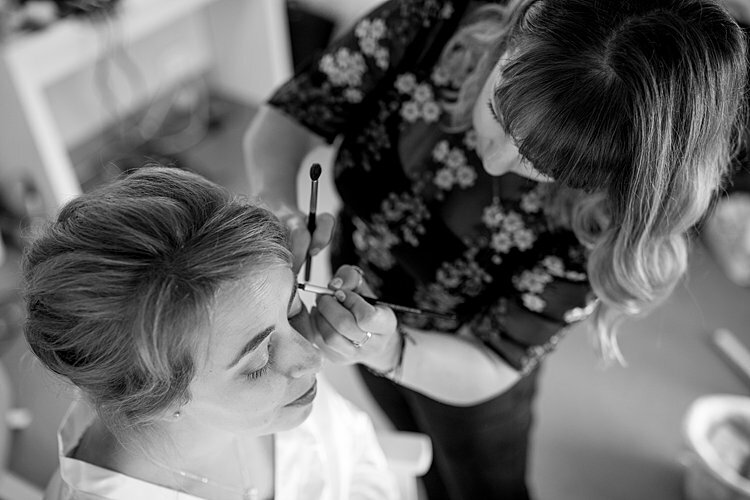 Laura totally got what I was after and absolutely nailed it – she made me look and feel beautiful. 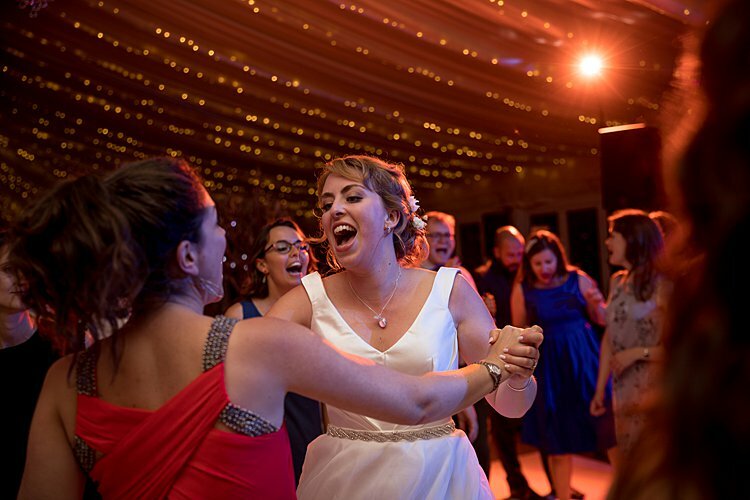 Both my makeup and hair looked very relaxed and natural, and neither moved an inch all night, which was impressive given the amount I danced (although it did take about 20 minutes to get all the pins out of my hair at the end of the evening!). 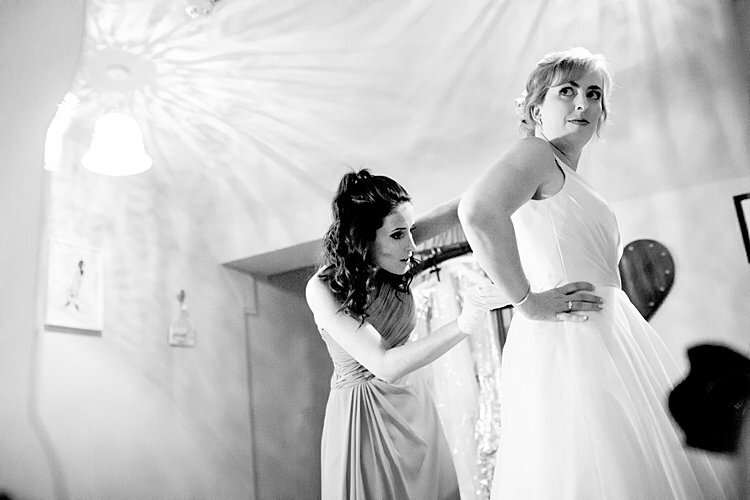 As well as making me look amazing, Laura was a wonderful person to have around on the morning of the wedding. She was completely calm, despite some slight dramas (my sister had a small car accident on the way to the venue) that meant we started an hour later than planned! 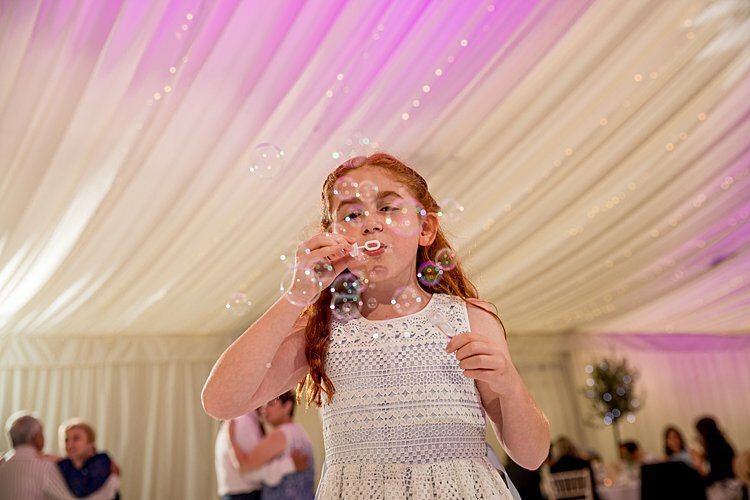 And she and her lovely colleague Charlotte kept me relaxed while also doing hair and makeup for my mum, 4 bridesmaids, and two flower girls. Laura was a total star and I cannot thank her enough! 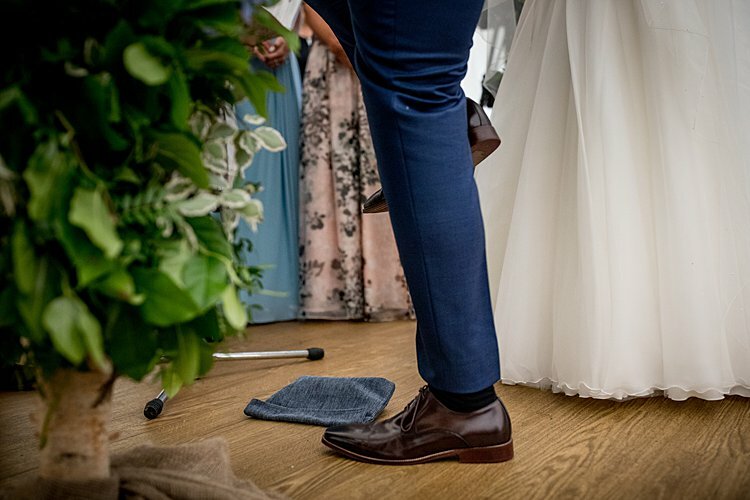 Ian decided to get a suit made for the wedding, because (I quote) “when else am I ever going to have the opportunity to do that?” He and his dad went to Tailor Made London and both got gorgeous, and slightly different, navy blue three-piece suits. 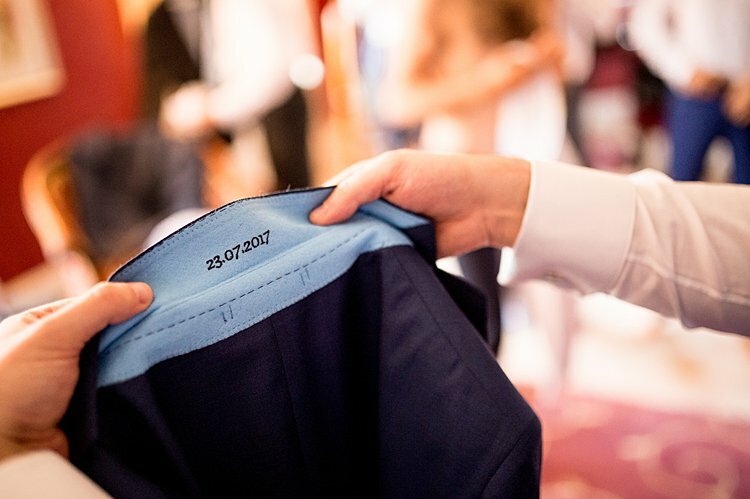 The back of Ian’s waistcoat was pale blue, to match the bridesmaids dresses, and he had the date of our wedding stitched in to the underside of the collar. 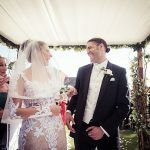 He loved the experience of having the suit fitted and made for him, and it was definitely worth it as he looked absolutely amazing on the day. Plus he’s worn the suits again twice so has already got more wear out of it than I did from my dress! My sister was my maid of honor, and my bridesmaids were my cousin and my best friends. They were a bit of a challenge to find dresses for as they’re all very different heights and sizes. So I quickly abandoned the idea of them all being in the same dress! I knew I wanted them in pale blue, but with so many different requirements the high street was never going to be an option. 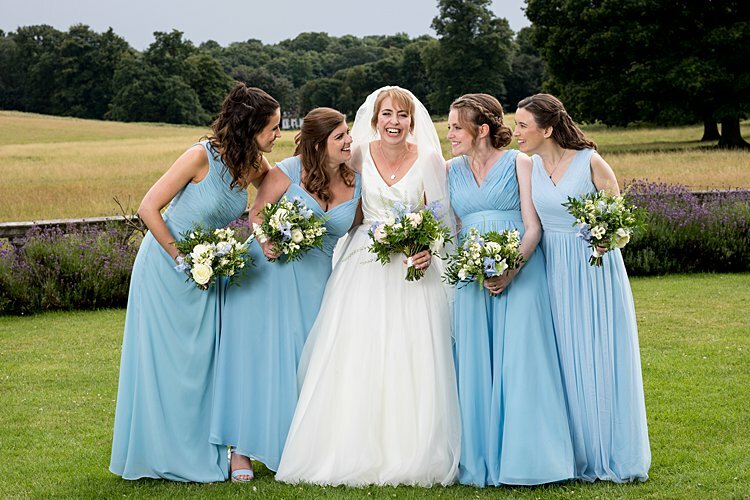 And lots of the bespoke bridesmaid dresses were ridiculously expensive. 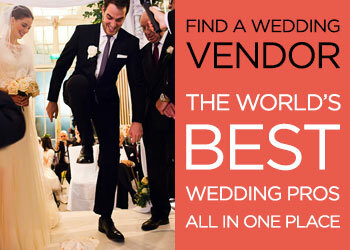 Then I came across For Her and For Him, a website specializing in bridesmaid dresses. It was perfect because it meant I could pick a color and they could all choose a dress they liked. I was a bit nervous about ordering dresses online, but they were good quality for the price, came out pretty true to size, and arrived without any problem. Ian’s two nieces were our flower girls, and his nephews were our page boys. 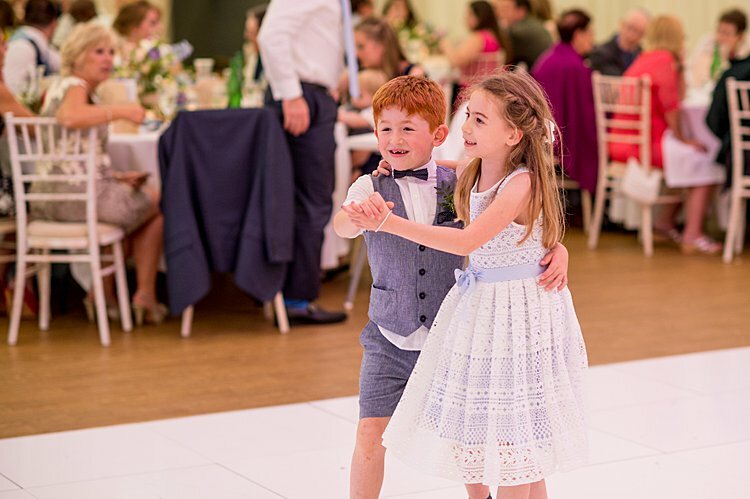 The girls wore blue and white dresses with sparkly trainers, both from Monsoon, and the boys wore waistcoat/shorts/bow tie combinations from Next. 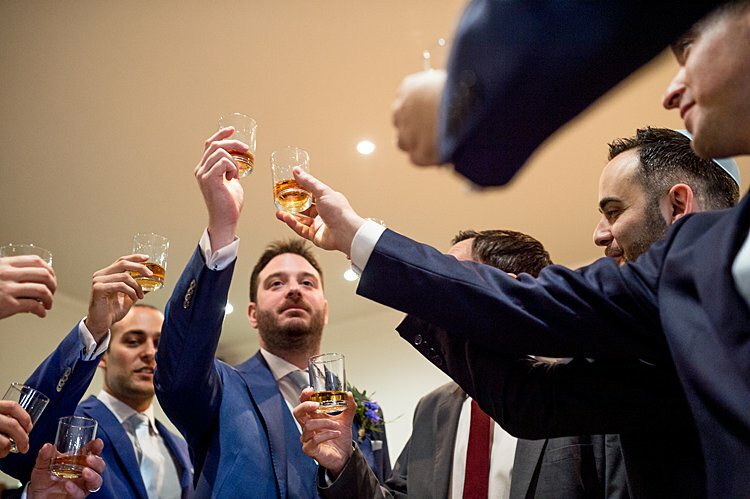 Our best man was Ian’s oldest friend, Paul, and Ian’s two brothers and 4 other close friends were ushers. 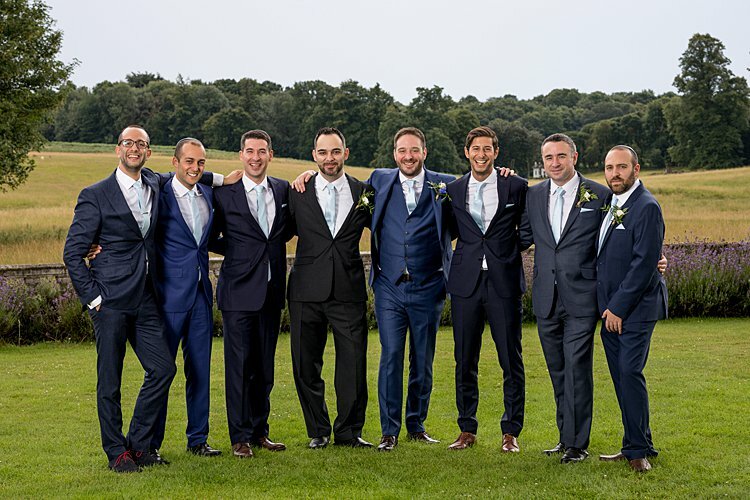 They all wore their own suits, and we got them pale blue ties and pocket squares from Asos to match the bridesmaids. 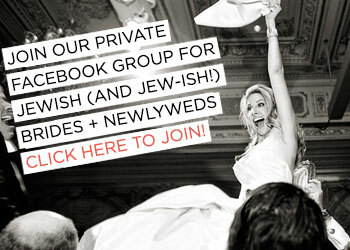 Our chuppah design was inspired by Smashing The Glass! 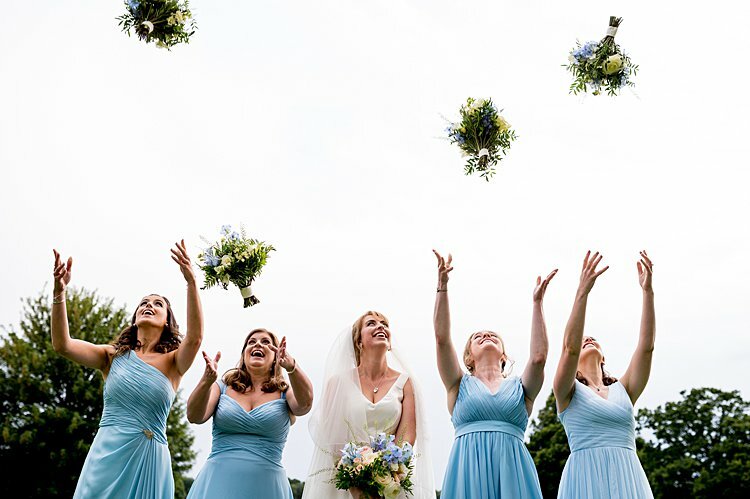 Before we were even engaged (yes, I was reading wedding blogs before I was engaged, slightly embarrassing I know) I saw a wedding on the blog (in fact, this wedding) where the bride mentioned getting all her guests to help decorate the chuppah with flowers. 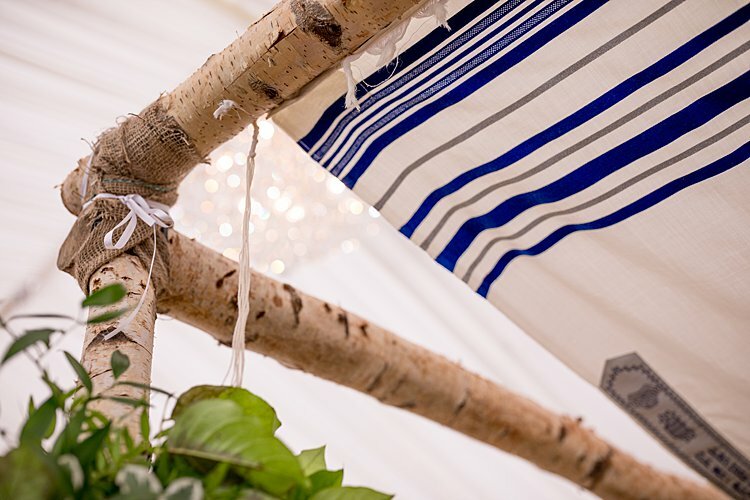 We found a very simple birch pole chuppah and our wonderful florist, Emma, decorated the uprights with lots of greenery. 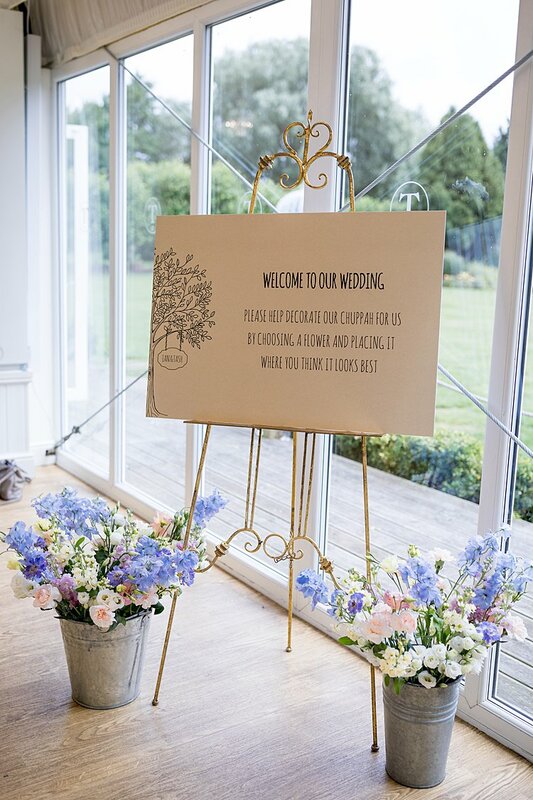 We had loads of individual flowers in buckets by the entrance to the ceremony, with a sign asking our guests to add them to the chuppah for us. My aunts oversaw things, making sure everyone didn’t put their flowers in the same spot, and it worked brilliantly. 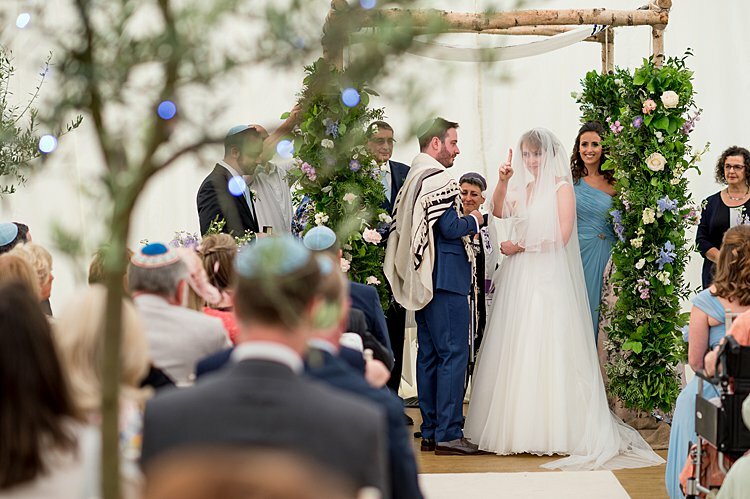 The chuppah looked amazing, and I loved standing under it surrounded by the beautiful thing all our guests had helped to make for us. Our ceremony was the bit of the day I was most nervous about. 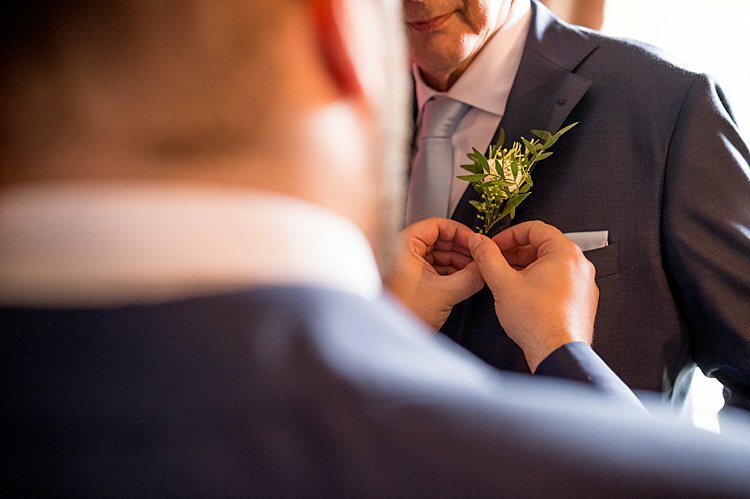 As well as standing up in front of so many people and the whole actually-getting-married thing, I knew it was the part where I would most miss my dad. But it was actually one of my favorite bits of the day, and definitely the most meaningful. 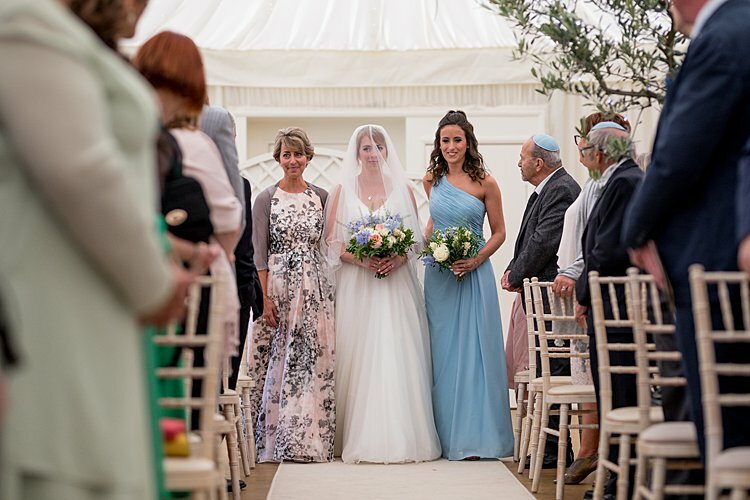 We had dad’s tallis for our chuppah canopy, so it felt very much as if he was there with us. 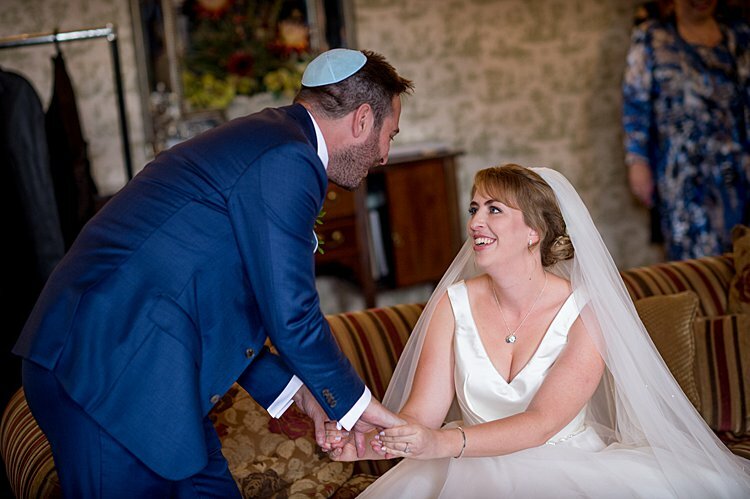 We were privileged that Rabbi Laura Janner-Klausner married us. 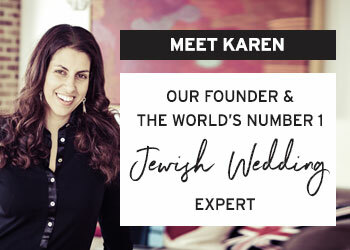 As well as being the senior rabbi to Reform Judaism, she’s also my cousin. 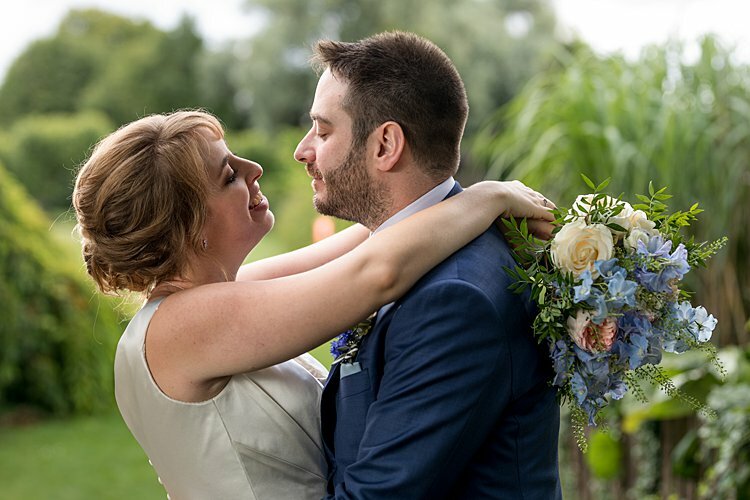 Being married by someone who really knew both of us made it doubly special, and she gave a beautiful address where she talked about us and our marriage, but also about my dad, which had everyone in tears. We worked hard to make our ceremony personal. 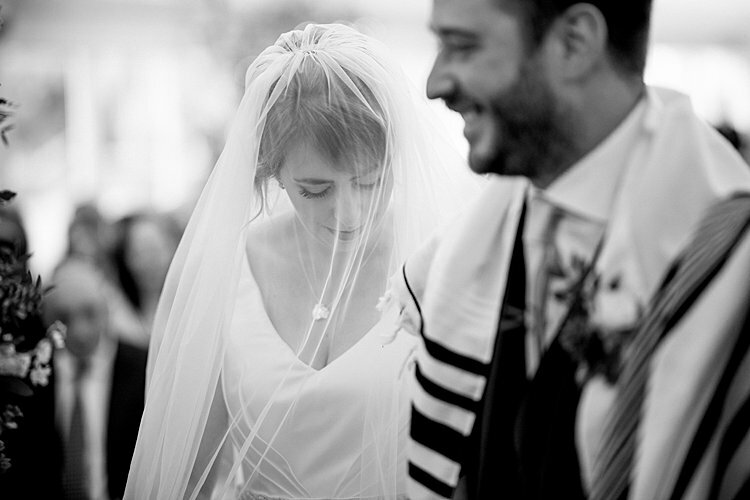 We wanted it to be egalitarian, so we both circled each other (I did three, Ian did three, and then we did one together), and we both said our vows and signed the ketubah. 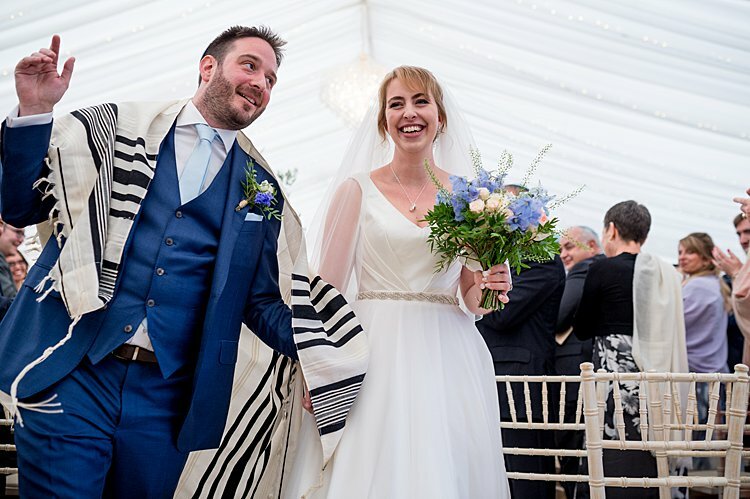 We wrote a guide to the ceremony explaining each element and what it meant to us, as a lot of my friends had never been to a Jewish wedding before and otherwise would have no idea what was going on! 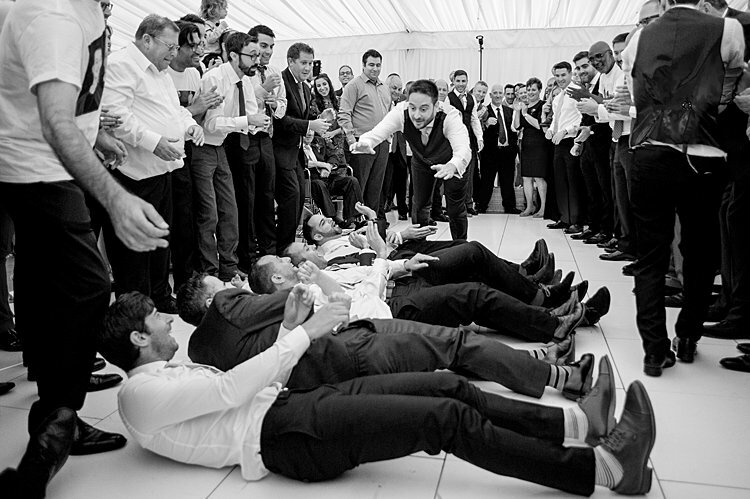 This was actually one of the most time-consuming bits of wedmin, but it was very rewarding because it made us think about the ceremony in real depth, which I’m not sure we would have done otherwise. The most special bit of the entire day for me was our badeken. We hadn’t seen each other for nearly a week before the wedding, which I really didn’t want to do (I thought it was just an excuse for Ian to get out of last minute preparations!) but actually made the whole thing much more emotional. I was shaking like a leaf before Ian walked into the room, but it was so amazing seeing him again. 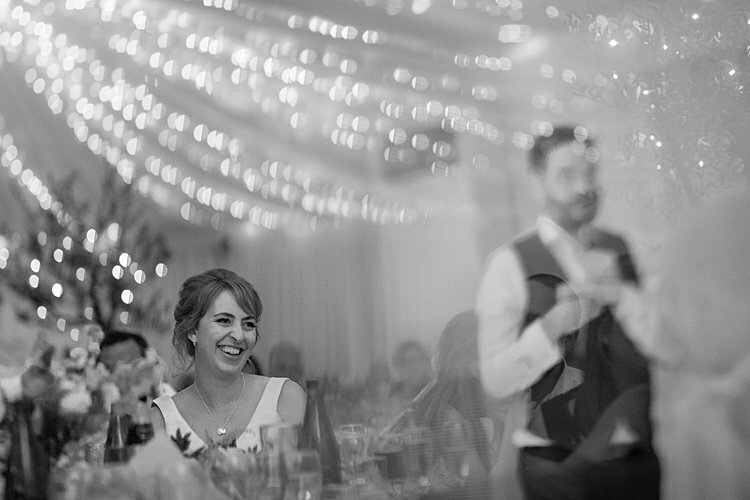 We had just our parents, siblings, bridesmaids and best man in the badeken room with us, and they each had a glass of wine over which they said a blessing or a wish for us. They then poured the wine from their glass into a carafe, and that’s what we used in our ceremony. 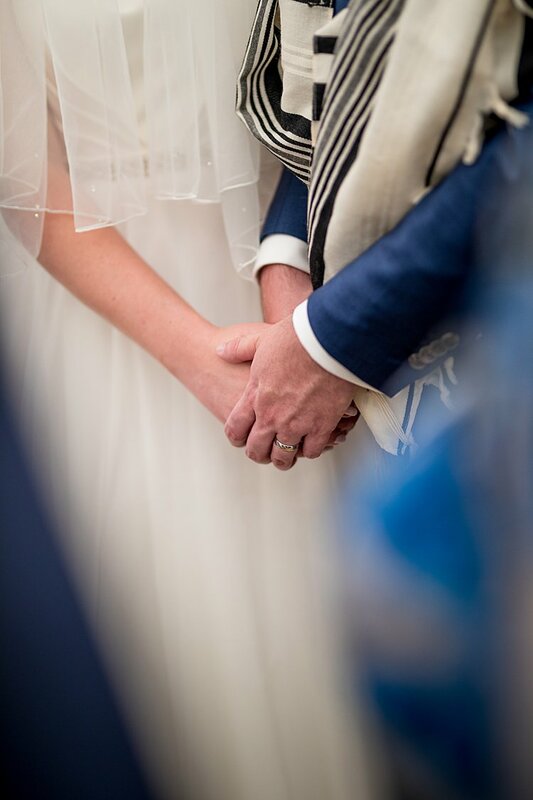 It was such a special, intimate moment and it meant that the wine we drank under our chuppah contained the wishes and prayers of the people closest to us. Our ketubah is one of our favorite things from the day. 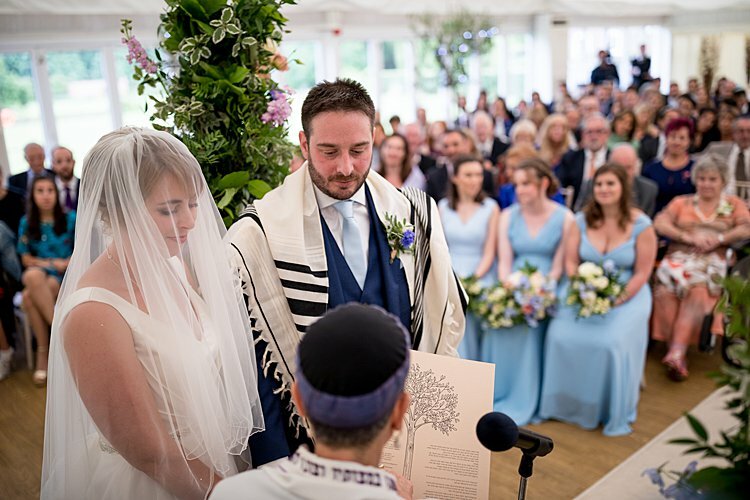 We wrote it together, setting out the promises we were making to each other and what we wanted from our marriage, and Rabbi Laura translated it for us and added the necessary detail about where and when we were married, etc. 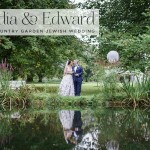 We absolutely loved the process of writing it, as it really clarified the whole purpose of our wedding. And we love having the ketubah as a reminder of our day. We had it printed so it matched the rest of our stationery, with the beautiful tree Emily drew us separating the English and Hebrew text, and it’s now framed and hung on our bedroom wall. 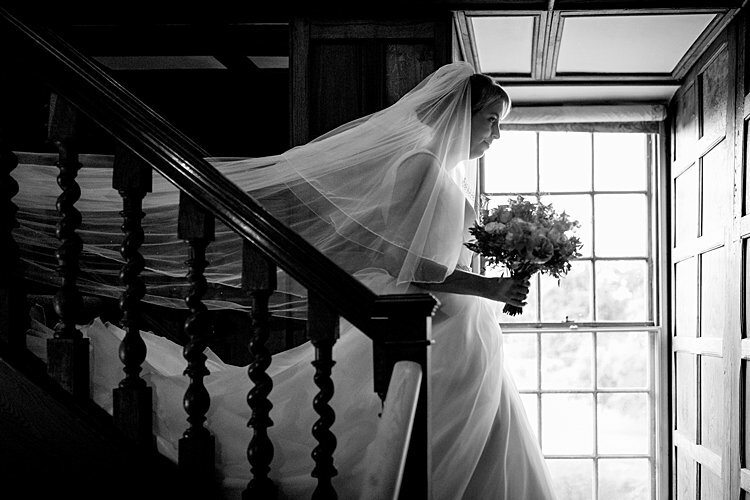 Our processional was Salut d’Amour by Elgar – I wanted something classical but slightly different. 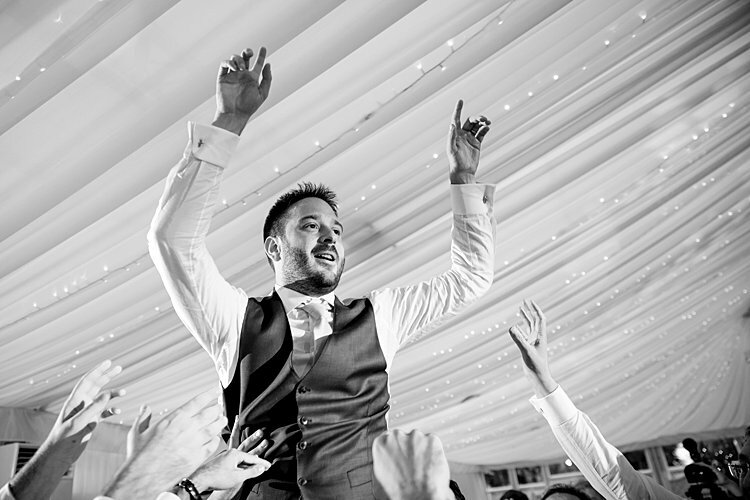 For our recessional Ian suggested Bring Me Sunshine by Morecambe and Wise, which was perfect as it was fun, unexpected, and made everyone smile – exactly what we were going for. 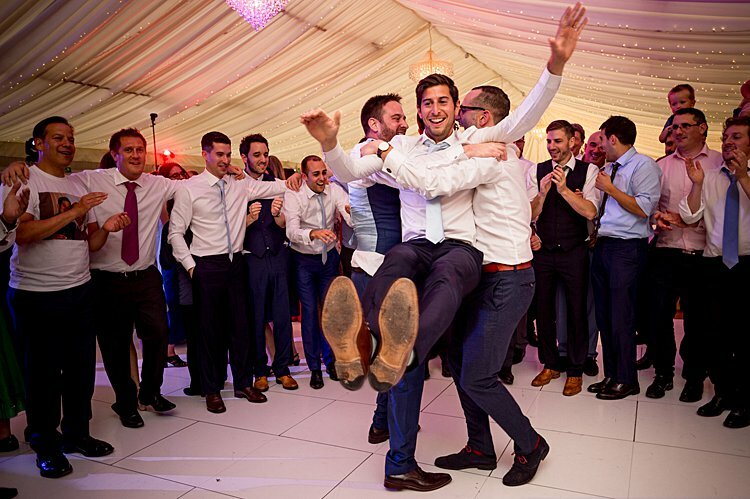 We even did a bit of the Morecambe and Wise dance down the aisle! 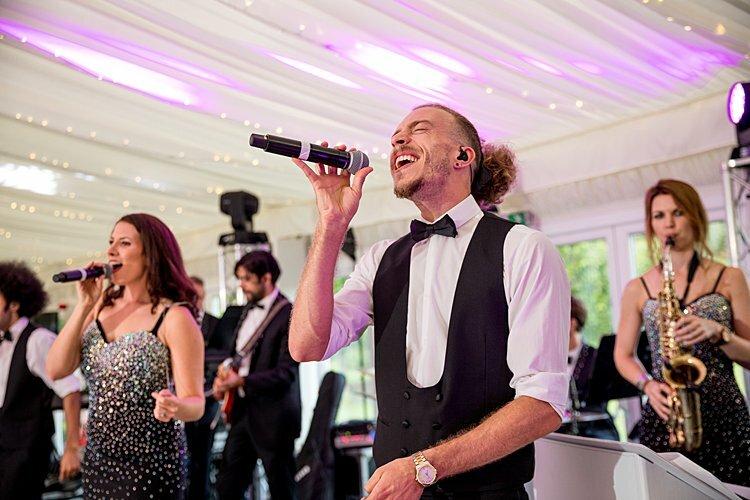 For our first dance, our fabulous band did a great version of Bob Marley’s Is This Love which is one of Ian’s favorite songs and also reminds us of Antigua, where we got engaged. 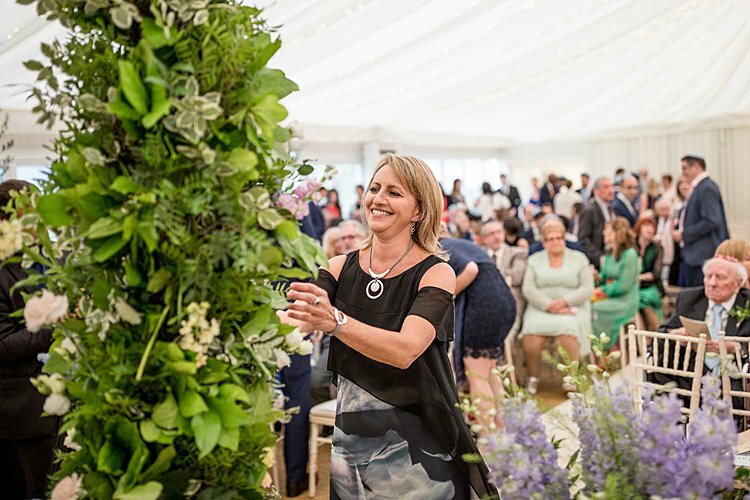 The fabulous Emma from Urban Flower Farmer was our florist. 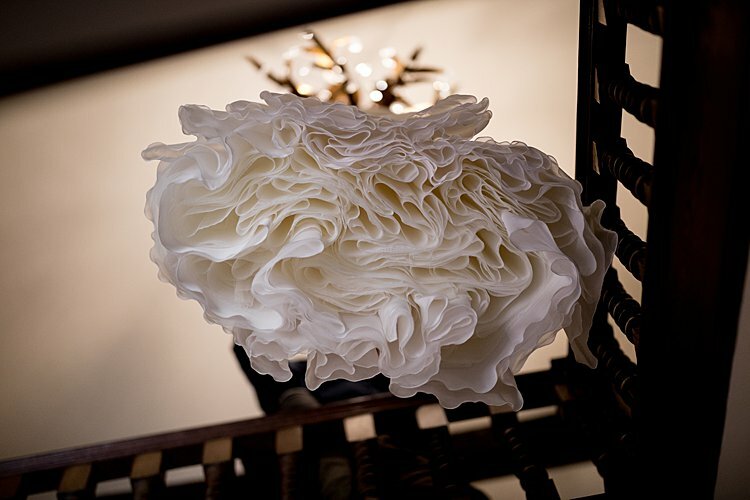 I had very little idea about flowers – I just knew I wanted everything to be relaxed, informal, and seasonal. Emma took my slightly random thoughts and turned them into stunning displays using her home-grown flowers. For table centers I didn’t want anything too huge and structured, because it wouldn’t go with the look of the wedding and I hate it when you can’t see the person on the other side of the table! So I stole an idea from my bridesmaid Gabi’s wedding and had multiple recycled glass jars with flowers and candles on a log slice on each table. As we had 20+ tables we needed a lot of jars, so we loads of people collecting them for us – family, friends, colleagues, my mum’s pilates class, literally everyone! It took absolutely ages to get the labels off. 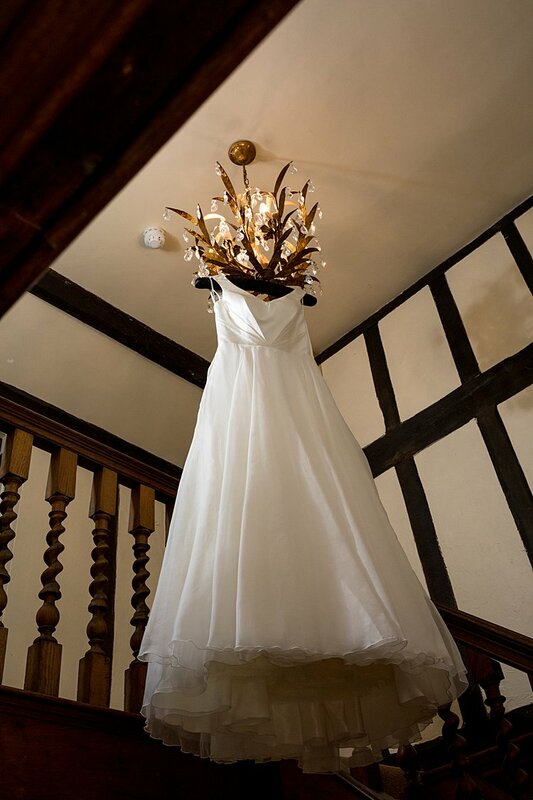 But it was worth it in the end as they looked amazing once Emma filled them with beautiful flowers. As well as the flowers, we also had trees. Yes, trees! 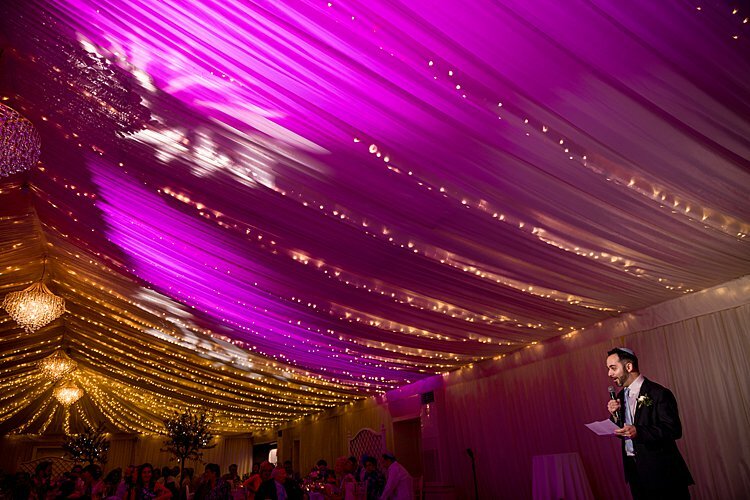 Because the marquee was enormous and all white, we wanted something to break up the space and inject a bit of color. So I came up with the idea of small tress, which would also tie in with the gardens and the tree motif of our day. 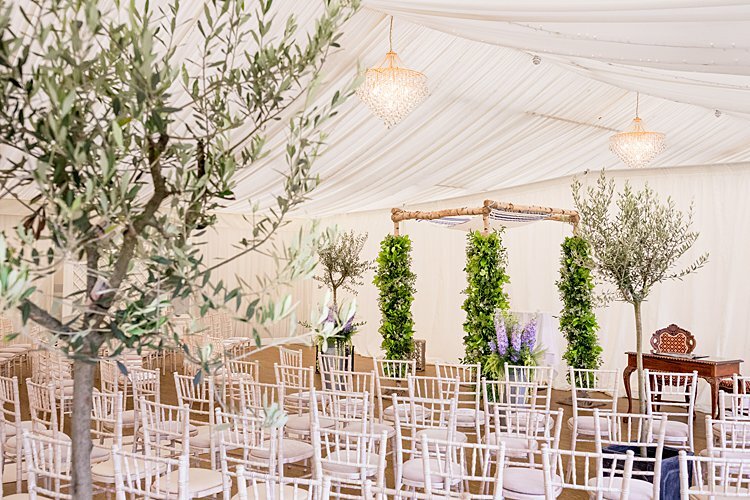 It was a bit mad, but Emma overcame all obstacles and made it work, and the 8 olive trees we brought in looked amazing all decorated with fairy lights. We knew way before we got engaged that Andy Tyler would be our photographer. Andy is insanely talented and takes absolutely stunning, natural shots. He’s also an old family friend, so it was a very easy decision! 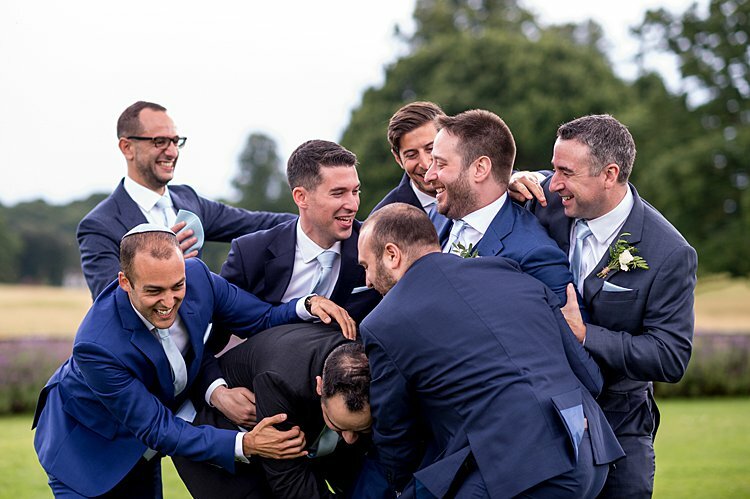 We absolutely love Andy’s style and the way he captures all the fun and emotion of the day, while also making everyone and everything look beautiful. He was everywhere and managed to capture everything, while being incredibly discreet and never getting in the way. We’re not fans of staged shots and didn’t want the day to turn in to a massive photo shoot. In fact, it was one of Ian’s requirements that there be no more than 7 formal photos! 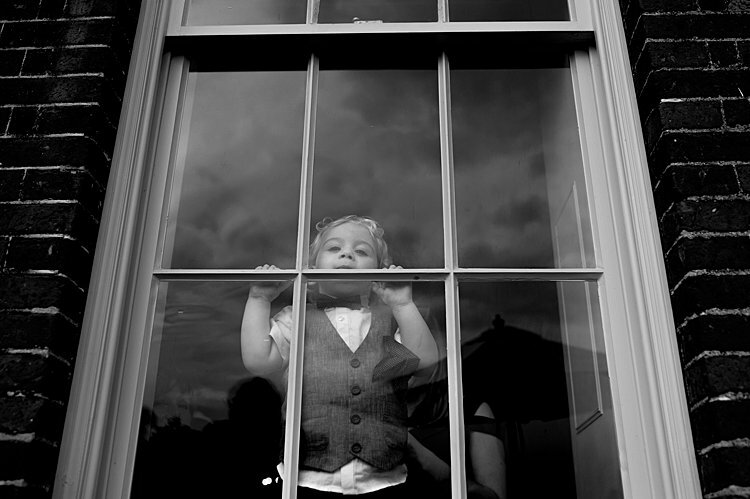 Andy expertly managed our huge families through these really quickly, and still managed to get some great pictures. And he made us both feel comfortable in front of the camera, which is a feat in itself as neither of us love having our picture taken. 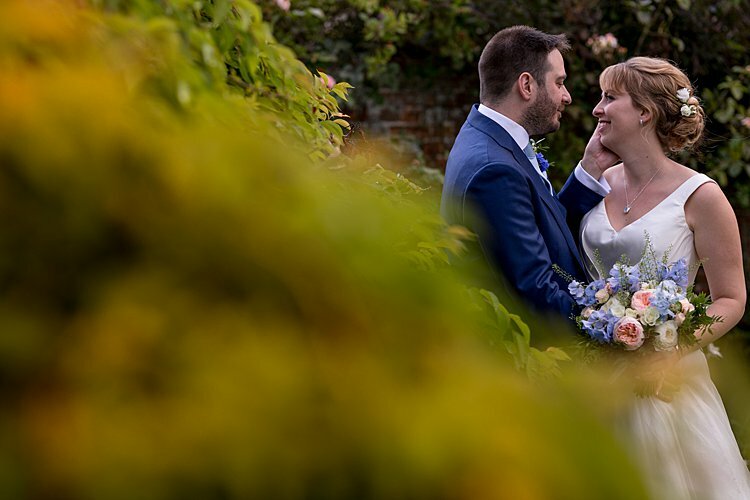 What helped on the money front was that my lovely and brilliant cousin, who’s a film director and editor, offered to edit our video for us as a wedding present. So Rideout Films just did the filming on the day. Dave and the team took some absolutely beautiful footage, and the final film Theo pulled together is amazing – I must have watched it dozens of times already! A colleague of my mum’s made our wedding cake. It was three different flavors of sponge (lemon, red velvet, and chocolate) and we kept it as a naked cake because I think they look amazing and anyway I don’t really like icing. 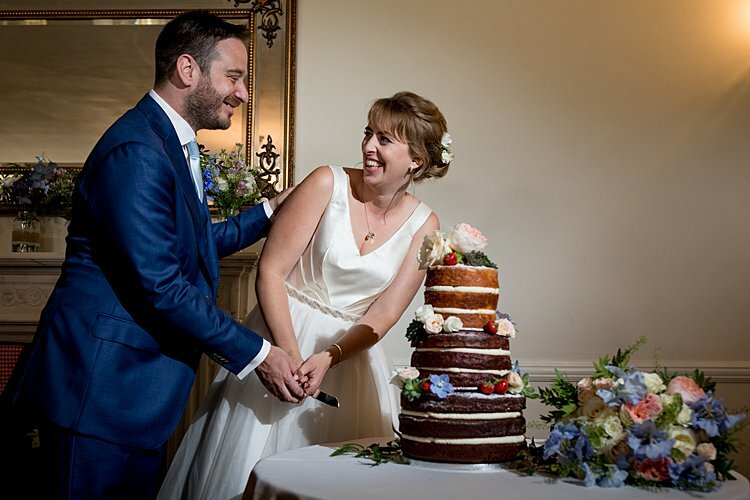 I’ve been to so many weddings where everyone’s full by the time they bring out the cake and it never gets eaten. Se we decided to have our cake as the dessert. It went down an absolute storm, and we didn’t end up with any leftovers, which was slightly disappointing as it was so yummy I’d have happily eaten more the next day! Parklands did our catering, which was great as it meant we got everything in one package. They did a fab job, and all the food was delicious. We went for a fish meal to accommodate everyone’s religious requirements, with Hermolis meals for our strictly kosher guests. 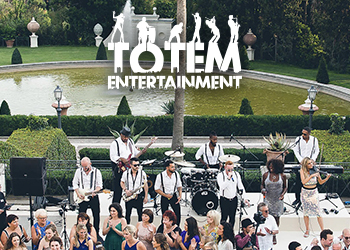 We knew we wanted a band, as they bring such a great vibe to the day. 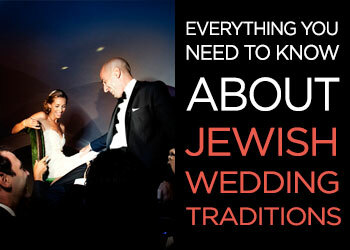 But the number of bands who can do a traditional Jewish wedding is limited, and we wanted a LOT of Israeli dancing! I was looking through Smashing The Glass for suggestions and came across XS Showband. We went to see them play and booked them immediately. 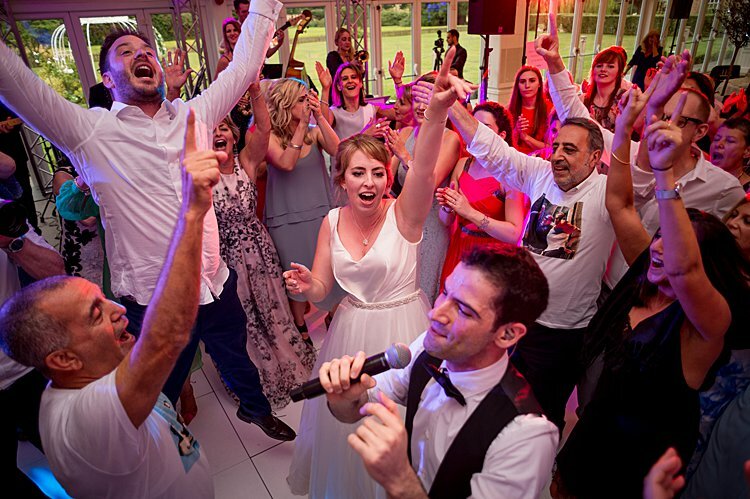 They were AMAZING – so many people said afterwards they were the best wedding band they’d ever seen. 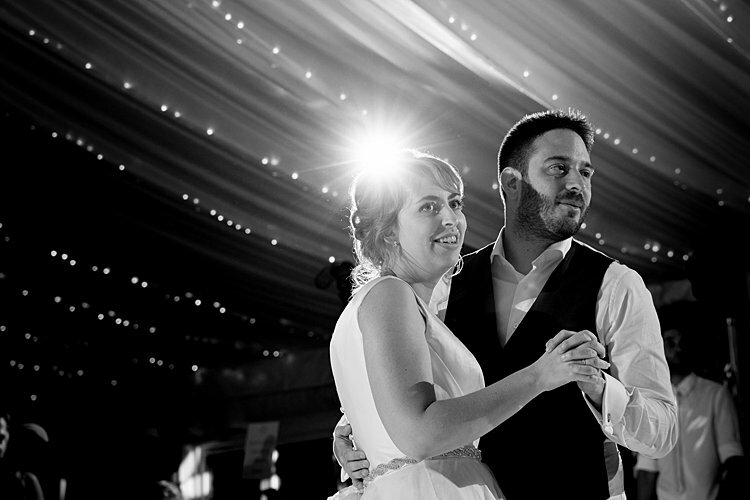 They created an incredible atmosphere and had everyone on their feet the entire evening. Literally the only time the dance floor was empty was when we made everyone sit down for speeches! XS brought such energy to creating a brilliant party for us. One of my highlights of the evening was when they had our nieces and nephew up on stage with them singing Ed Sheeran to the entire room! And their fab saxophonist played during our reception, which was really lovely. 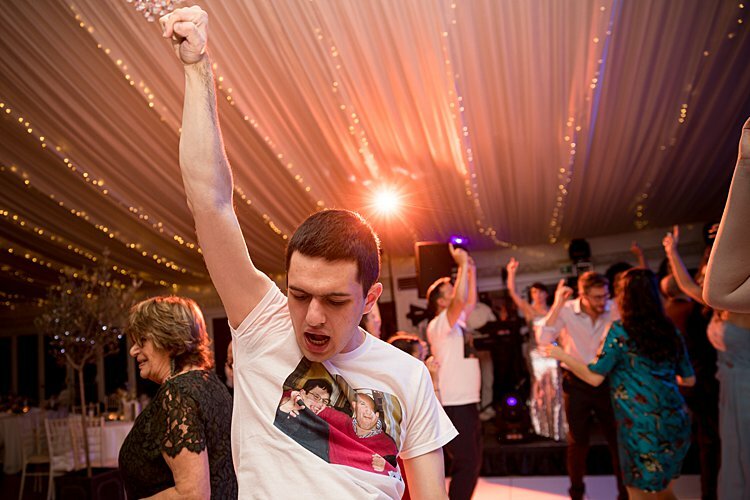 Top tips if you’re going to have lots of Israeli dancing (we did two rounds – one before dinner and one between starter and mains): drink lots of water, make sure the groom has at least two changes of shirt, always sit sideways on the chair during the hora so you can hang on to the back, and if anyone’s going to try skipping don’t do it with a single table cloth as it’s too short and you’ll be tripped up – although there is a hilarious photo of Ian flat out on the floor as a result! I didn’t want formal favors as I think they often end up being left behind and wasted. But we got a load of flip-flops so ladies could change out of their heels, which proved very popular. 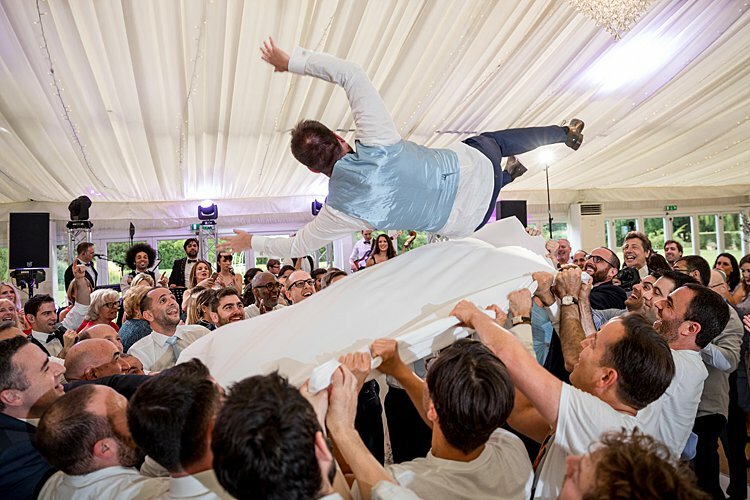 And we had baskets of face towels beside the dance floor during the Israeli dancing so people could refresh themselves. Plus we encouraged guests to take jars of flowers home with them as informal favors, which worked quite well and meant a bit less clearing up the next morning! Obviously one of the big things for us was how to make sure my dad was included in the day. 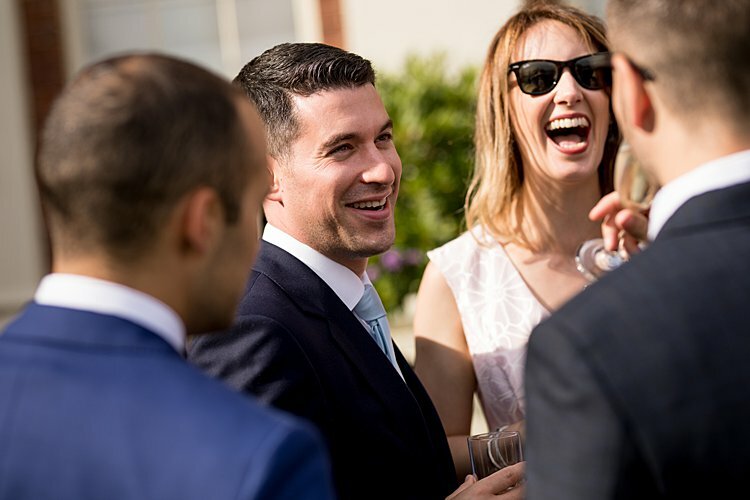 He absolutely loved a good party, so as well as mentioning him in the ceremony we wanted him to be part of the more informal side of the celebration. My mum came up with the idea of getting a dozen or so of his closest male friends and relatives to give her pictures of him and them. She had these printed on t-shirts which each of them put on before the meal started. 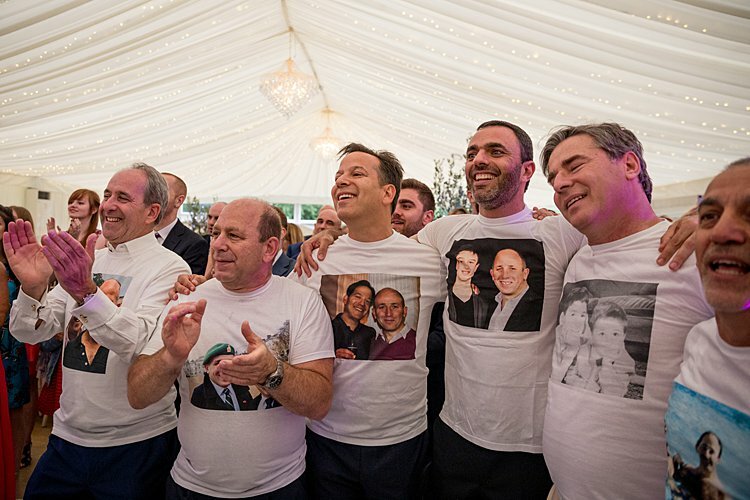 Then when everyone was waiting for our entrance they came out dancing around dressed in their t-shirts and wore them all through the Israeli dancing that followed and the rest of the night. 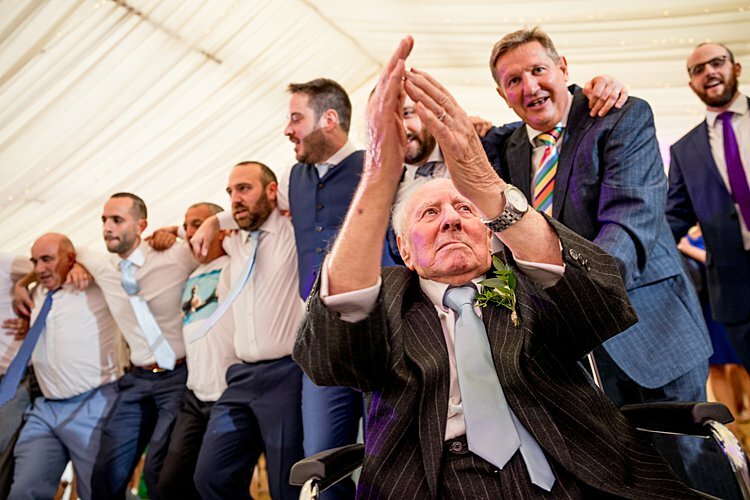 It was a really special way of reflecting back just a little of the joy my dad brought to everything and meant that I danced surrounded by him at my wedding, which was incredible. 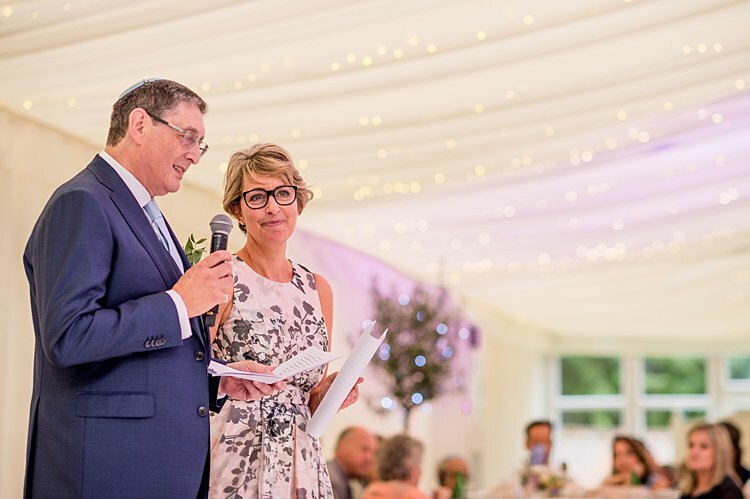 My mum made a speech, but as a surprise to us she also invited Ian’s dad to join her, which was amazing and meant that they told embarrassing childhood stories about both of us! 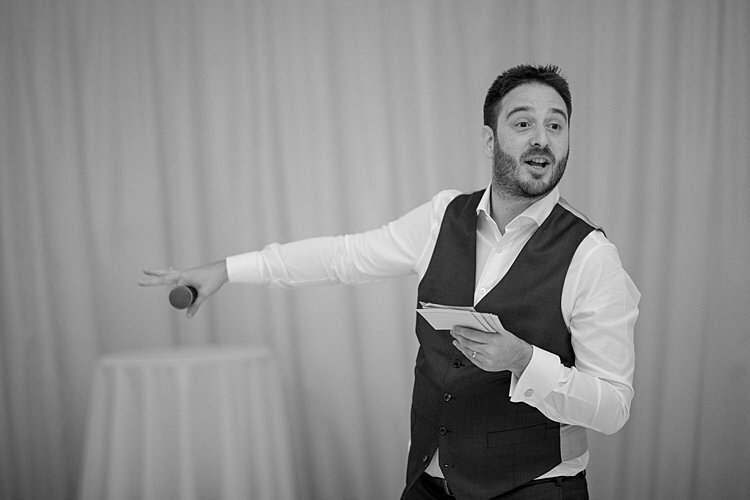 My bridesmaids also did a speech because I didn’t think it was fair the best man got all the limelight! And I was never going to sit quietly and let everyone else talk, so I did a speech as well as Ian. That’s quite a lot of speeches, so we broke them up between courses to stop guests falling asleep. But that was never a risk anyway, as everyone did an amazing job and they were all hilarious. Between nieces and nephews, cousins, and friends’ kids we had LOTS of children at our wedding. 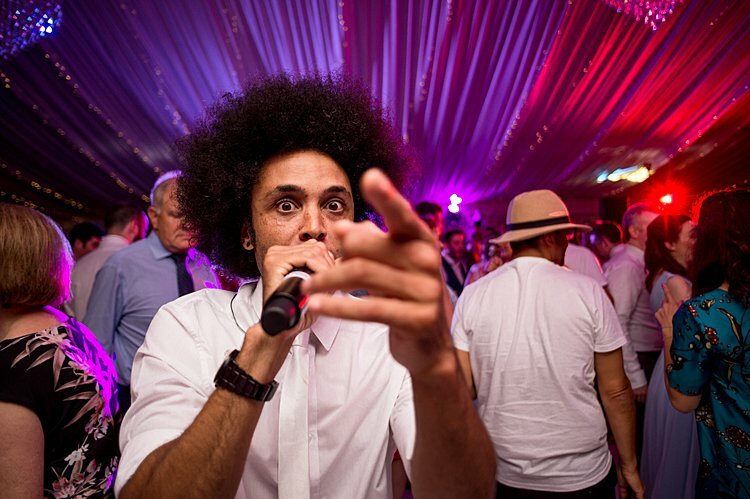 So to make it easier for the parents and stop them all having to go home at 6pm to put the kids to bed, we hired Stephanie and her fab team at Safe and Sound Childcare to provide a creche, which kept all the little ones entertained (when they weren’t stealing the show on the dance floor!). 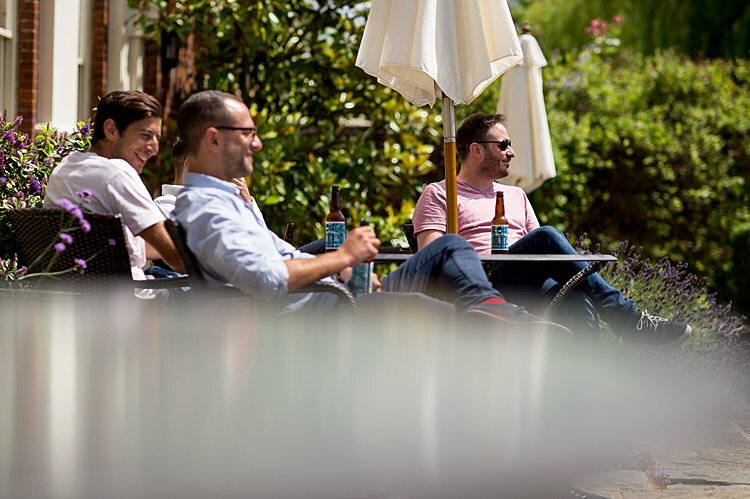 Everyone says “enjoy the planning process, it goes so quickly.” And it’s true, but it can also be really stressful, especially if you’re coming home from a busy job and feel like you’ve then got almost another full day’s work to do on wedmin! So I think it’s important to cut yourself some slack and not think you have to have everything sorted straight away. I was quite overwhelmed by to-do lists in the beginning, but actually if you break it down it is manageable. 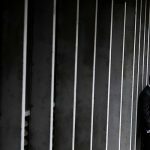 The most helpful thing for me was working through the timetable of how the day would run. Once I had that, I was able to think about what would need to happen at each point, who we would need, etc. 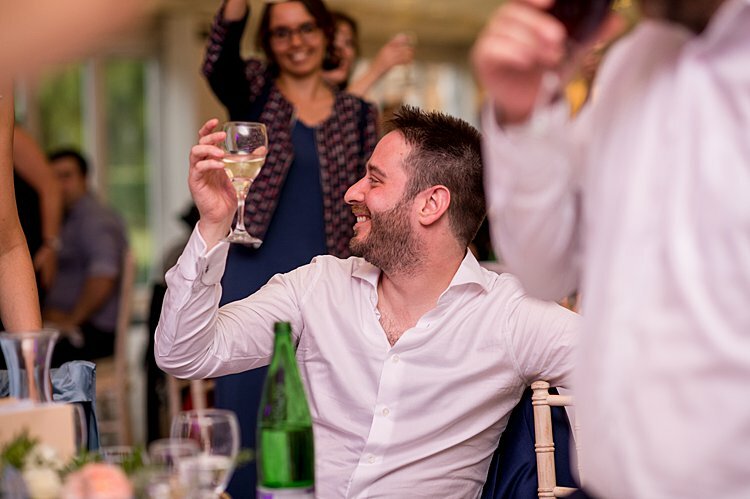 I think it’s also important to acknowledge that weddings can send even the sanest and most balanced people slightly mad! 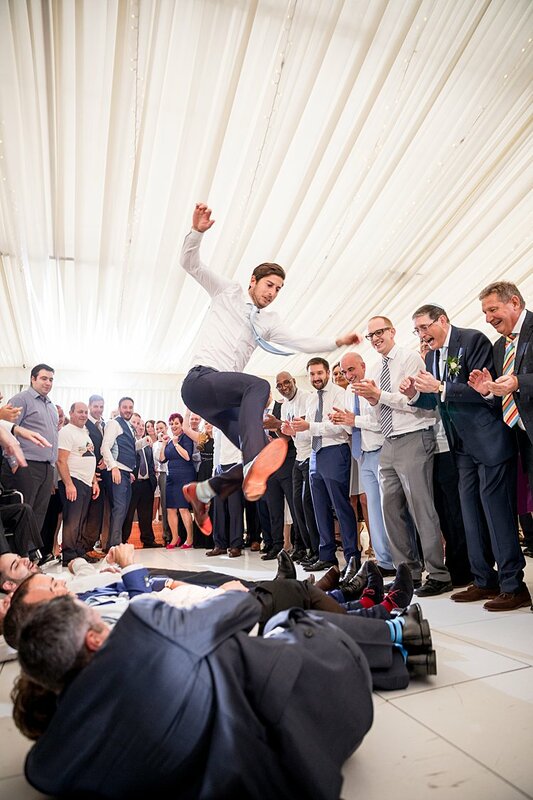 Everyone I know who’s planned/been involved with planning a wedding has lost the plot at some point over something that in retrospect turned out to be quite ridiculous. I don’t think you can avoid this, but the key thing is to try and keep some perspective, and remember that no one else there knows how things are supposed to go on the day. So if they go wrong literally no one but you will know, let alone care. 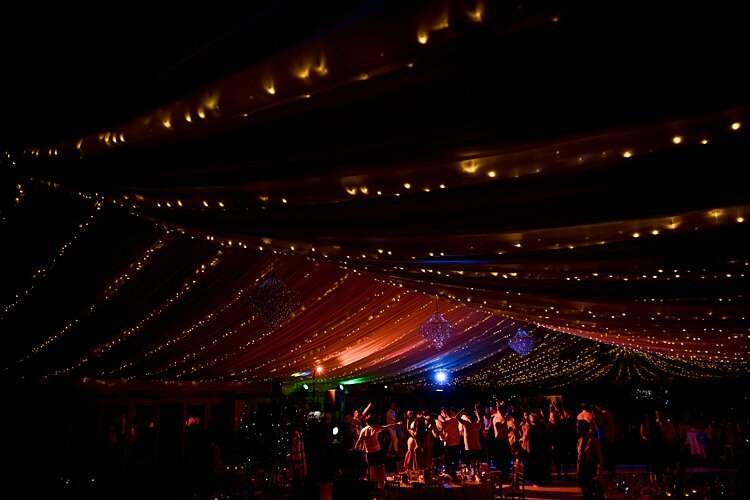 On the day itself, while most of our guests were on the dance floor, we went outside and looked in to the marquee for a couple of minutes. It was such an incredible feeling seeing everyone we love in the same place, and knowing they were there because of and to celebrate us. It was the best thing we did and I don’t think I’ll ever forget that moment. 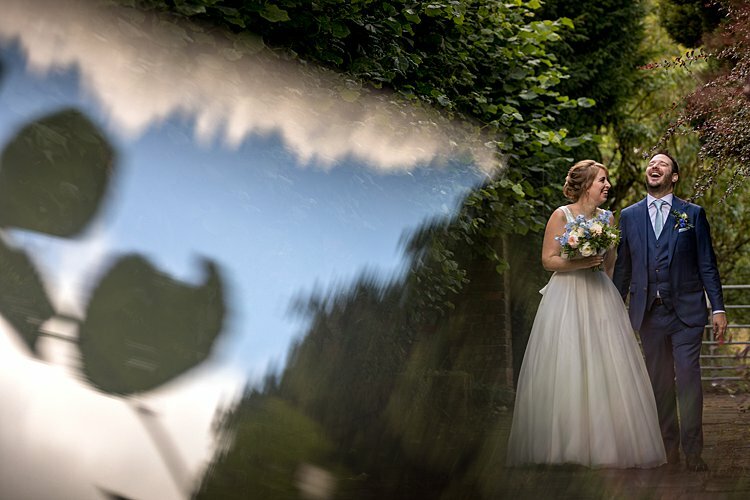 Finally, the main thing I took from my whole wedding experience is that you can still have an absolutely incredible day even if it’s not perfect. My dad not being there was a huge hole in our wedding. But his love and joy was reflected back at us by so many wonderful friend and family who surrounded us and still made it the most wonderful celebration and a bloody good party too!